Find affordable car rental in Rotorua with VroomVroomVroom. We compare car hire from suppliers such as Budget, Hertz, Avis, Thrifty and Europcar in locations across New Zealand. Rotorua is known as the North Island's adventure capital. It has a long history of tourism; back in the 19th Century the Pink and White Terraces were considered the 8th wonder of the natural world, and many visitors came to see them. This spectacle was destroyed by the eruption of Mt Tarawera in 1886, but geothermal wonders continue to be a huge draw card for the city. There are 18 lakes and three major rivers in the Rotorua region, with many ways of possible exploring. Another popular and accessible activity is the Skyline Rotorua Luge and Gondola. Why book a rental car in Rotorua with VroomVroomVroom? Great rates: Always try to book your rental car well in advance. Car rental rates depend on supply and demand. This means the more rental cars that are available, the more opportunity you will have to grab yourself a bargain. Wide selection of vehicles: Our rental car partners have locations all over New Zealand so you can book from any pick up location in the North Island and make Rotorua your destination. Aside from the numerous car rental options, we also compare campervan hire deals. Trusted since 2001 - We have been helping people book the perfect rental car for more than a decade so let our expert customer care team help you as well. The temperatures in Rotorua can get quite chilly in winter, even dropping below 0 degrees celsius. In summer the temperatures are far more pleasant, hovering at around 20 degrees. Visit the city around January to take advantage of the great weather. If you are into extreme sports, then make sure to check out the amazing mountain bike stunts at the Crankworx World Tour held every March. You can also join the annual Rotorua Marathon held every May. The roads around Rotorua are well-signed, and you shouldn't have much trouble navigating the highways. The city is about 230 kilometres south of Auckland, and just under an hour from the popular Hobbit movie set. Take care when driving on the winding roads, and maintain slower speeds in hazardous conditions. There are only three toll roads on the North Island, and none are located in Rotorua. Whether you are a newbie or a professional, River Rats Raft and Kayak has the perfect rafting and kayaking activity for you! From a gentle raft trip to an extreme raft adventure, you will definitely get the thrill that you are seeking for. If kayaking is your thing, you can paddle across scenic Lake Rotoiti to reach the Manupirua Springs Hot Pools on Lake Rotoiti. This summer, you can try the evening kayaking which includes a BBQ picnic, thermal swim, and a tour to the glow worm cave. Imagine lakeside views, breathtaking sunsets, and warm mineral pool. You can experience total relaxation and pampering at the Polynesian Spa, which is one of the oldest international spas in NZ. The award-winning spa features different mineral pools that are suited for individuals, couples, & families. It also offers spa therapies that will leave you feeling brand new. If you're looking for the ultimate adventure, then make sure you try all the adrenaline-pumping activities at Agroventures! You can find the world's ONLY Shweeb here, which is a human powered monorail racetrack. Aside from that cool ride, you can also try the Swoop super swing and experience how's it like being Spiderman for a day or fly like Superman by trying out the Freefall Xtreme. Not to mention the Bungy and Agrojet, all a must-do if you're an adrenaline junkie or seeking to get out of your comfort zone. Buried after the great Mt.Tarawera eruption in 1886, the peaceful village of Te Wairoa makes one of the most interesting archaeological sites in New Zealand. Its sure to bring out your inner Indiana Jones as you explore the world-class museum highlighting the remains of the village & take the waterfall trail to get a glimpse of the spectacular Wairere Falls. The Buried Village or the village of Te Wairoa is a living museum. 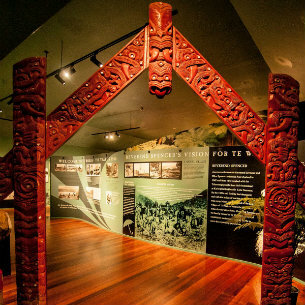 It is a place where visitors can experience a one-of-a-kind New Zealand history. The Museum takes its visitors on a heart-moving journey about the story of the village, the voyages to the Pink and White Terraces, and the eruption of Mount Tarawera. Aside from the heart-melting history, you can also walk at the scenic pathways that links the different sites, view the marvelous wilderness above the Wairere Falls that looks out over remote volcanic scenery, and many more. Experience the three “S”s of fun with Kawarau Jet Rotorua! Speed, spins, and splash as ride the K Jet. Combining the thrill of jet boating and parasailing, this adrenaline-pumping activity consists of a 30-minute jet boating and 10 to 12-minute parasailing. Want a break from the high-octane activities, ask about the Hamurana Springs walk. Whether you are on a family holiday or a business traveller, ASURE's 17 self-contained units, which include one and two bedroom units with spa pools, studio units (also with a spa pool) and a fully furnished townhouse off-site) are well-equipped for your Rotorua accommodation needs. 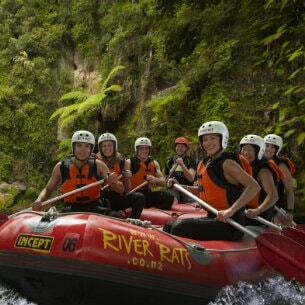 There is so much to do in Rotorua - with high adrenaline adventures, a diverse range of local Rotorua attractions and fantastic dining at our highly recommended restaurants and cafes. 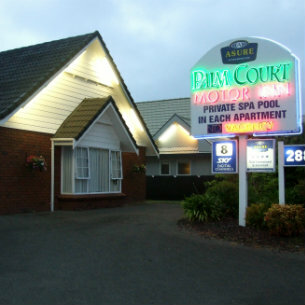 ASURE Palm Court Rotorua Motel also helps keep you up to date with the latest events in Rotorua so you can enjoy your stay even more . Ranked #1 of 94 hotels in the city and the newest, stylishly elegant and classy boutique hotel that has you in awe the moment you step through its doors. Not just a clean, hospitable environment; this hotel offers and experience of pure luxury with its designer furniture, custom beds, luxury linens and robes, monsoon rain showers & soaker baths, spa area, thermal pool, mini gym, concierge service, 24hr reception and valet parking. You will feel like royalty! Located in the heart of downtown area, you'll find the #1 hostel. Bold, bright, spacious and newly refurbished, with a rock climbing wall that runs the full height of the building all adds to the delight of those who stay here. Free unlimited Wi-fi, pool table, XBox and table tennis makes for a great opportunity to meet those from around the world. A delicious fine dining experience with a spectacular view. With award winning menu, this restaurant offers a top quality experience that not only offers great food, but also superior service and a lodge like cosy, warm atmosphere. Experience a little piece of France in the middle of the city. This cute little french cafe offers exquisite service, atmosphere and of course food. The perfect place for brunch or a coffee break from all the excitement of the wonderful attractions. Been to the above attractions? Share your Rotorua travel experience below. Bike enthusiasts can check out 10,000 wheels in over 10 days! This global event is the defining celebration of world class mountain biking. It's the first event in a series, with the second in Les Gets, France and the final in its home of Whistler Canada. The Rotorua event is held at the Skyline Gravity Park and Whakarewarewa Forest trail network. There's a kidsworx programme included. In its 52nd year, the Rotorua Marathon is known as 'The People's Marathon'. Held in a perfect setting, with distances to suit almost everyone, and lots of opportunities for indulgence after the race. Motorsport action over two days in and around Rotorua. Budget Rotorua - 1230 Fenton St, Rotorua, NI. Hertz Rotorua Downtown - 1233 Amohau St, Rotorua, NI.